MARKS AND SPENCER INDIGO Ladies Cardigan. Centreback to hem; 22". 3/4 Length Sleeves. Chunky knit cardigan in beige, natural colour. This is a lovely cardigan by M&S Autograph Weekend in Size 12. Length 30" Shoulder - Hem. Chest 20" Armpit - Armpit. Sleeves 12" Underarm - Cuff. Great condition. Ladies M&S black sparkly sequin cardigan. 3/4 length sleeves. Size 10. Ladies M&S black sparkly sequin cardigan. Condition is Used, but excellent condition as only worn once. Vibrant and versatile! Can be worn as cardigan or sweater. M&S Per Una range. 3/4 sleeved with orange piping to neckline and button area. 100% Cotton. M & S Cotton tunic style sweater - red mix 14. Condition is Used. Dispatched with Royal Mail 2nd Class. Ladies Per Una Waterfall Front Longer Length Cardigan M&S Size 20. Condition is Used, but only worn a few times. It is a summery peachy colour and has an unusual lace up detail to the back and 3/4 length sleeves. Lovely Spring or Summer cover up. Length at back approx 26”and at front approx 32” Dispatched with Royal Mail 2nd Class. M&S MARKS & SPENCER NAVY PURE COTTON POPLIN ROUND NECK JUMPER 10 38 RRP £29.50. Pretty lilac coloured twinset from Marks and Spencer. It has a V neck front and back. Great condition. They may also look different on different monitors. This cotton blend longer length cardigan is in black. It has 3/4 sleeves that can be rolled up & buttoned. It has a V neck with button fastenings & the buttons carry on up the V decorative only. 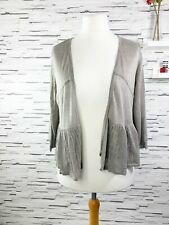 Ladies Size 12 Grey and Floral Combi Cardigan Tunic Top . Beautiful cream lace detail edging at bottom and around neckline . 31” long . Spring Fashion NEXT. Condition is Worn once . Perfect condition . Dispatched with Royal Mail 2nd Class. Marks&Spencer Weekend Grey Mix Striped Longline Cardigan Size 12 UK . Condition is Used, some minor bobbling Start price reflects this and no returns Dispatched with Royal Mail 2nd Class. M&S Collection Black Cardigan. Open front - edge to edge style. Marks and Spencer Orange And white cotton jumper cabling at front. Mock Blue and white spotted shirt collar and cuffs attached .Size 14 . The jumper has been worn a couple of times but it does not suit me. It is machine washable and has been kept in a smoke free pet free home in the wardrobe. Dispatched with Royal Mail 2nd Class recorded delivery. Thanks for looking. Nice jumper, smart navy & white striped, 3/4 sleeves. WHITE WITH A LIGHT PINK/BLUE FLORAL PRINT. This is a nice jumper with a blue background and multi coloured spots in a UK size 10. This is a long sleeve jumper from. Marks & Spencer's Indigo Collection. It is shaped around the bottom and longer at the back with small side splits. Navy Blue Knitted Zip Up Cardigan. Cotton Knit. M&S Collection. Get the perfect feminine and relaxed look in this cardigan decorative cream / blue/ abstract print. 100% COTTON knit. orange top stitching. This top is perfect and would be great with leggings or trousers, jeans - dress up or down – suitable for any occasion. Jumper - 100% Cotton. Lace Trim - 100% Cotton. Loose Knit. Round Neck. 3/4 Sleeve. Cotton (100%). Note - Colour of item might be slightly different from the picture because of lighting or monitor settings. I try my best to show the item as it is. Cotton blend. Lightweight knit. Machine washable. Length: 25". 3/4 length sleeves.